So you go to a Thai restaurant a few times a month — maybe even Twist on Thai! 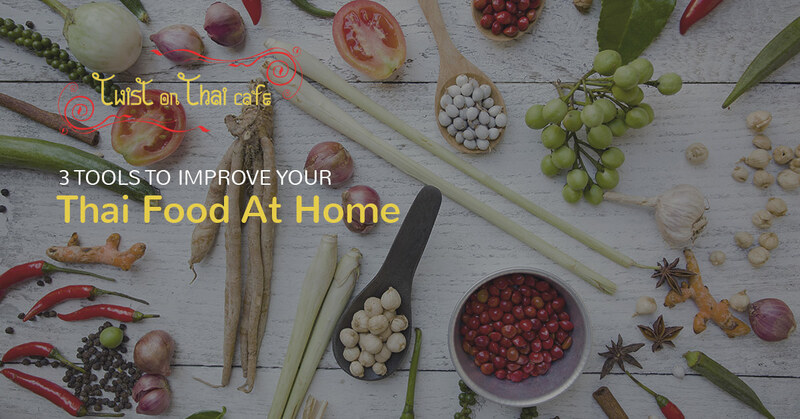 — and you’ve experimented with making your own Thai food at home. Good job! Thai food is full of rich flavors and interesting textures that every true chef should play with at some point. If you’re looking to take your home-cooked Thai meals to the next level, here are the tools you need. They make the cooking process easier, and you’ll seem like a cultured expert when you have friends over for dinner and they see your Thai kitchen gadgets. No Thai kitchen is complete without a well-seasoned wok. You’ll have to put in a little elbow grease and oil it up when you first purchase it, and re-oil it periodically throughout its life, but it’ll be well worth it. Just like cast iron, it’ll hold flavor and you can season it to your own personal perfection. The wok will be large and hold everything you want, from your liquid curry to your giant pad thai. Just throw it in and let it cook away, while you still have the kitchen space to do everything else you need to. You won’t use this every time you make rice to go with your Thai dish, but you’ll love having this unique kitchen tool to steam up your sticky rice. It’s fairly large and you only use it for sticky (glutinous) rice, but the results are well worth it. The biggest benefit of this piece is that it allows you to steam a large amount at once. You soak the rice overnight, drain it, and place it in the bamboo basket. Then place the basket on top of a pot of boiling water and let it steam away! 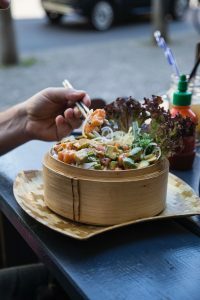 You’ll end up with khao neow (ข้าวเหนียว), the traditional sticky rice you eat with your hands with dishes like green papaya salad (som tam) or other northern Thai food dishes. You’d be surprised how often you might end up using a mortar and pestle. With this tool, you’re able to grind food and create pastes much easier than you could with a food processor. 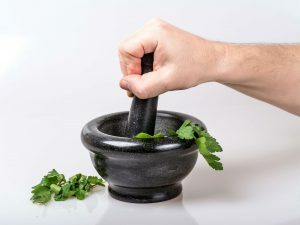 By grinding and pounding your herbs and spices instead, you’ll extract the flavors and essential oils out of them better. Mortar and pestles made out of granite or clay are the most popular ones in Thailand. Typically granite is used more for heavy-duty tasks and clay for lighter tasks such as som tam. Plus, a mortar and pestle looks great on display on your kitchen counter! 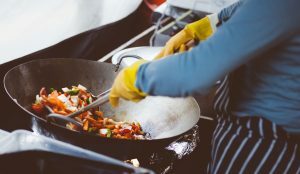 There are many other tools that you could use to cook Thai food at home, such as a multi-tiered steamer, a hand grater, or a citrus juicer (what Thai dish is complete without lime?). However, these three will give you a good base to start with as you dive into the wonders of cooking Thai food. Get inspired with what meals you can learn to make when you visit Twist on Thai in Hopatcong! Next time you have a craving for pad thai, try our Royal Pad Thai dish and then try to replicate it at home. Visit us tonight or set up a reservation for your next dinner out on the town.